Windows software often stores its configuration in the Windows registry. The software and system configuration of your Windows nodes hence relies on a clear and correct registry management. The technique is only a fancy overlay of the registry_entry_* generic method. Each Registry entry is a typed key/value pair. The different supported types are described on the Microsoft Powershell documentation here. This is the types name given by Powershell, if you try to read/access registry by another way than Powershell, the types name will most likely be different. To make sure a key is present/absent on the node you can use the generic methods as-is. Rudder only supports local Windows registry at the moment and registry keys have to be relative to Computer. 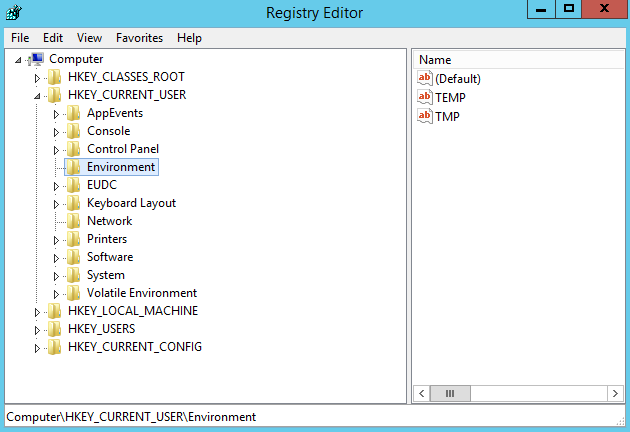 For the key Computer\HKEY_CURRENT_USER\Environment pass HKEY_CURRENT_USER\Environment as Key parameter. If you want to manage the value of a registry entry, you can use the associated generic method. If the associated registry key is not already existing, Rudder will not create it. In some rare case, if you really want to manage a registry entry even if it is not already existing, you can always couple the registry_entry_key_present with the registry_entry_present to enforce this behaviour.